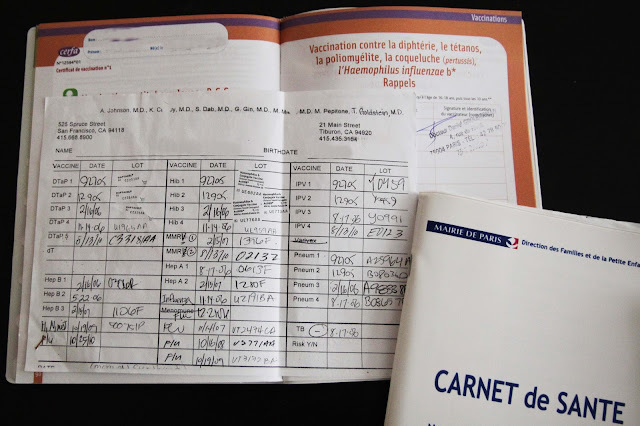 In France, we are responsible for making sure our children are fully vaccinated and recording it in the "carnet de santé" ("health notebook"), which we are also responsible for guarding and never, ever losing. You lose it, you lose your child's medical records. It's very 19th century. Our children's vaccination pages look very different than the French kids', since we've copied over the records from our American pediatrician's office and stapled them in the book. Our doctors (and schools) look carefully over these pages to confirm our girls have, roughly, what the French kids have. They do, plus some special vaccinations for a trip we took to Senegal. Plus one extra the French kids don't have: The French children don't get vaccinated against chicken pox, officially known as varicella and called "varicelle" in French. My understanding is that usually when children catch chicken pox, it's not generally that serious and it gives them excellent life-long immunity. The vaccination, on the other hand, has the reputation of possibly not giving full and life-long immunity. 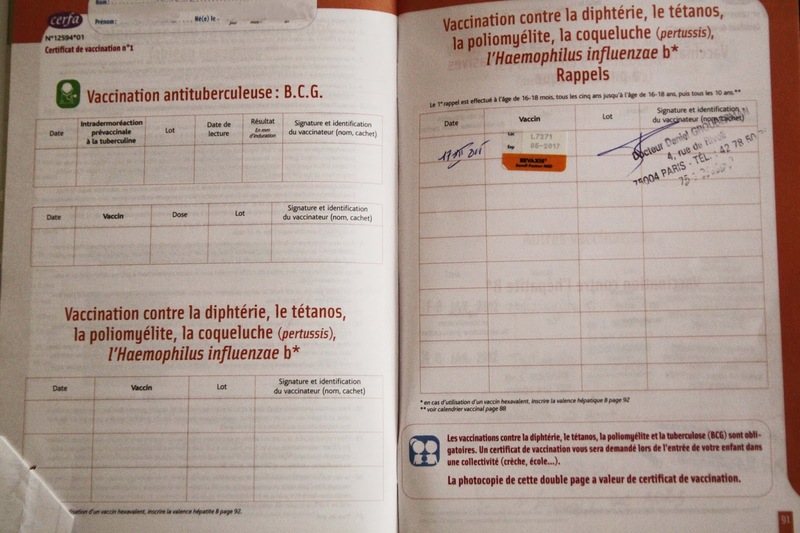 So the French prefer to simply let their kids get chicken pox. 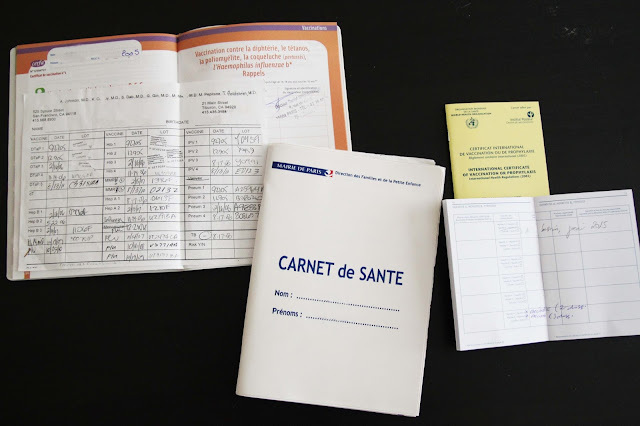 The vaccine is on the World Health Organization's List of Essential Medicines, so cynically, the cost of the vaccine ($100-200 in the US) may also have something to do with why the French government doesn't include it for its citizens, who get nearly-free health care provided by the state. The word "vaccine" comes from the Latin Variolae vaccinae, which means smallpox of the cow. That's because in 1796, a scientist named Edward Jenner noticed that milkmaids who had recovered from cow pox could not re-catch it. He developed the innoculation for the Variolae vaccinae, and later the word "vaccine" simply became synonymous with innoculation, in honor of Jenner's discovery. The name just about says it all: Vacher Vendéen, meaning a cows' cheese (vache) from the Vendée (an area in Western France along the Atlantic Coast). The Vacher Vendéen is made from pasteurized cows' milk, made with lactic fermentation and pressure to achieve a semi-hard cheese. It sells in local supermarkets in the Vendée, but probably not many other places far from there. The thick, blackened crust is edible, but dried out and not terribly appetizing, even to the French people we break cheese with. Even to me. The cheese itself has a somewhat rubbery texture and overall the flavor is mild -- too mild. Altogether, it's an OK cheese but nothing special. Besides the nice alliteration for Vacher Vendeen representing a varicelle vaccination, I also like the fact that, as with the word "vaccination", the word "cow" appears in the name of this cheese: "Vacher" from the French word "vache" meaning "cow" and coming from the Latin root "vacca" from which we get the word "vaccination", since vaccinations themselves were originally made from a version of a pox from cows. I'd rather get a cheese from the cows than a pox any day.